We spend a lot of time at Charter Wood thinning out and managing the 25 acres of woodland planted in the 1990’s to celebrate the granting of the Royal Charter to Norwich in 1194. You would have thought that we already had enough to keep us busy at this site for many years to come but we have a new project to extend the woodland further planting up new areas previously restricted by overhead power lines. The high voltage power lines have now been buried ready for further housing development in the Bowthorpe area. So, the plan is to infill between two established areas of woodland creating a continuous tree belt along the edge of the A47. This project will take some weeks to complete the planting of around 1500 trees. Our Friday group were tasked with starting the project. Our meeting point is around 1.2 kilometres from the planting area so a bit of a walk before we start. Additionally, Matt couldn’t get the truck any closer than 700 metres to the site, so it was a matter of loading up four wheelbarrows with as much of the equipment as possible (stakes, guards, trees and tools) with the volunteers carrying the rest (including the all important brew kit). 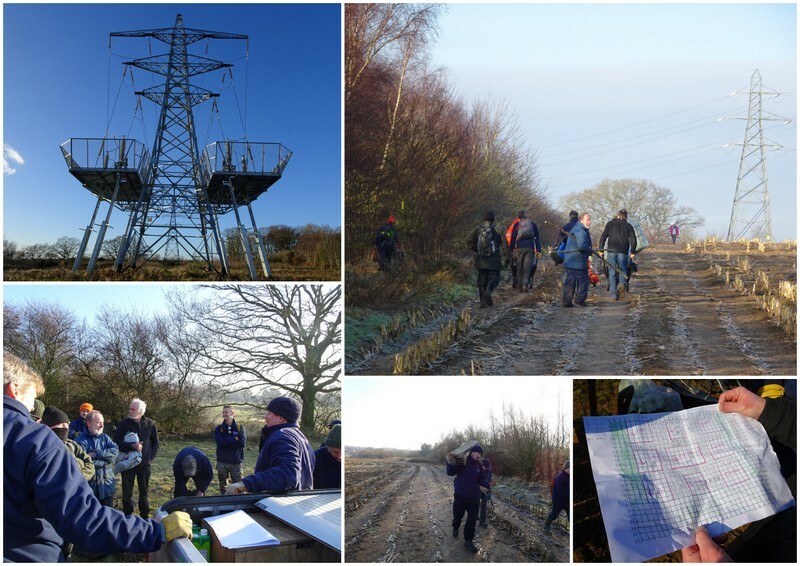 Off we set on the long trek through the woods and along the field edge to set up camp near the gigantic pylon which dominates the site. The pylon forms the end of the overhead section and feeds the cables into the underground ducts. It is truly massive, like our own Blackpool Tower but without the entertainment (although working with a group of 14 volunteers is entertaining enough in itself!). We started with a briefing on the planting plan and an overview of the area to be planted. Matt’s plan divided the area into sections with a planting plan for each section. The trees would be planted at 2.1 metre spacing in a grid of 26 by 31 stakes. After a bit of discussion and an exchange of views on how and where to start the first stake was placed and everything else measured off from this. This initial area was around 50 by 60 metres and about half was covered by bramble and scrub which needed clearing. Fireman Chris made a start with the brushcutter on the scrubby areas while we sorted out our tools and plan of work. The overall area was determined, and the boundaries staked out. Matt had cut 2.1 metre hazel stakes to use as measuring sticks and these were used to set the position of the intermediate tree stakes which were then knocked into position. We split into groups with volunteers measuring and placing stakes and others placing tree guards on these ready for fitting. Planting teams were formed with pairs buddying up to dig holes for the trees, fit the guards and secure these to the stakes. The first trees planted were hazel which required small pits to be dug for their fairly large roots. The area had been levelled following construction of the pylon and covered with a layer of sand and gravel. Being stony it was not easy to dig the pits and as we worked towards the area of brambles, roots became a problem also. But the teams worked away following Matt’s master plan. 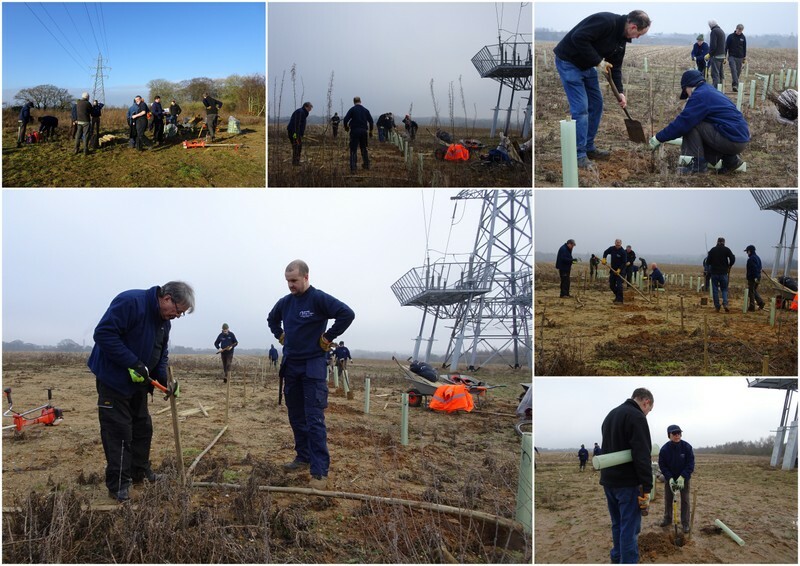 With around 14 of us working away we methodically dug, planted and secured a variety of trees. Belts of hazel form the boundaries of the site with sections of lime, beech and oak planted in squares. These will be surrounded by hollies, field maple, hawthorn, bullace, guelder rose and spindle and rowan. 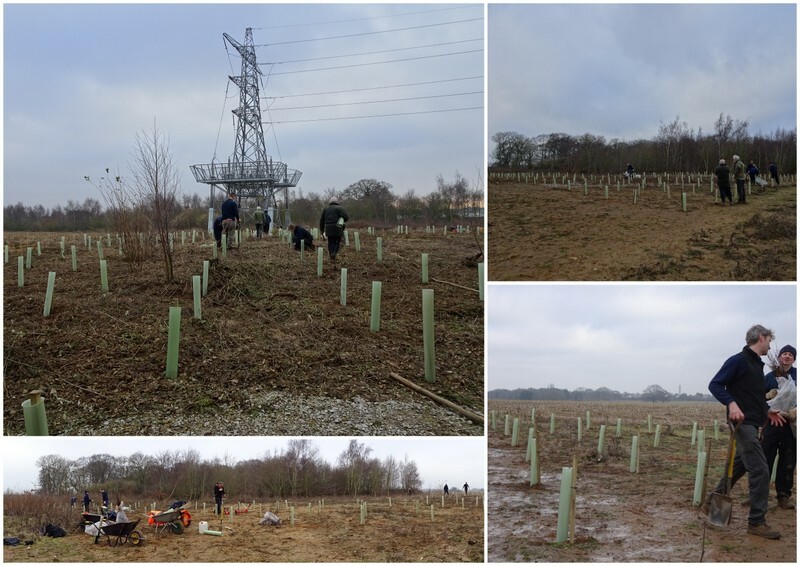 By the end of the day we had marked out much of the site and planted around 300 trees out of the 800 planned for this area. So, a few more days work is required before we move onto other areas. All we had to do now was load up the barrows with all remaining kit and trudge the 700 metres back to the truck to unload and then carry on a further 500 metres to the car park. Another busy and fairly tiring day completed with a lot to show for our efforts.